Definition at line 303 of file CQNewMainWindow.h. Definition at line 308 of file CQNewMainWindow.h. Definition at line 305 of file CQNewMainWindow.h. 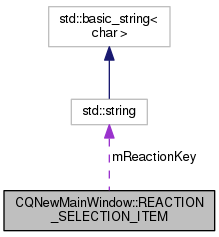 Referenced by operator<(), and CQNewMainWindow::selectReaction(). Definition at line 306 of file CQNewMainWindow.h.